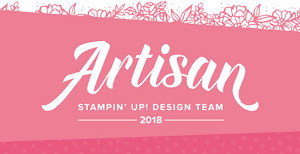 It's a busy weekend, this catalogue Sneak Peek and a new Stamps in the Mail kit using the gorgeous Blooms & Bliss collection. So Paisleys and Posies is an intriguing collection in the new Autumn:Winter catalogue launching 1 September 2016. To tell you the truth at first glance I wasn't entirely sure if it appealed to me. And then my creative mind took over (probably whilst I was sleeping !!) and I had so many ideas that I had to make a second preorder of new goodies - yay ! With this set I created the shaker card for the Pinkies Blog Hop last Thursday and I have a number of video tutorials lined up throughout the Saturdays in September using just this set. And after creating with it I can thoroughly recommend it to you - you will not regret purchasing the stamp set. I don't have the dies or the DSP - but this is one stamp set where you can make your own DSP, like today's card. In fact I was so impressed with this set I used it as my Showcase for the new catalogue with my customers, and a number have already said that they love it too and will purchase it :) Yay for sharing crafty goodness.